The ribbon cutting kicks off Feria de Educación 2017. Photo by Lee Choo. 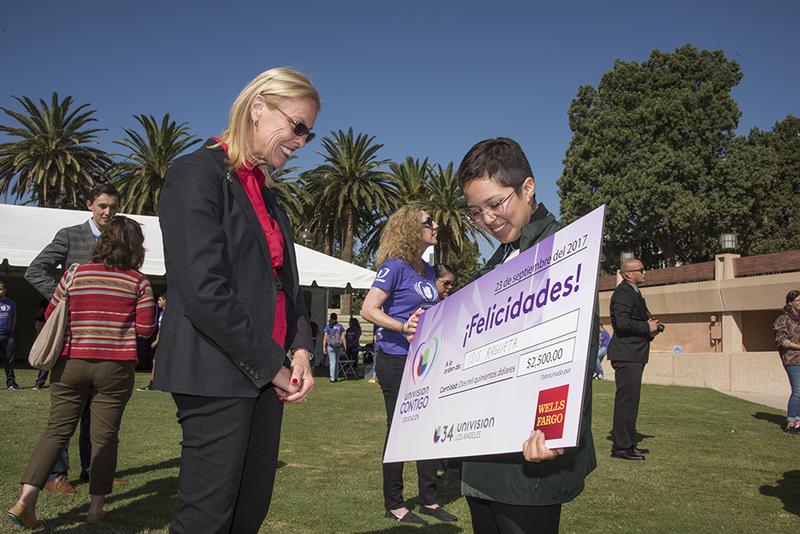 Izzy Argueta, a CSUN freshman and Bridge to the Future scholar, showed her oversized scholarship check to CSUN President Dianne F. Harrison. Photo by Lee Choo. 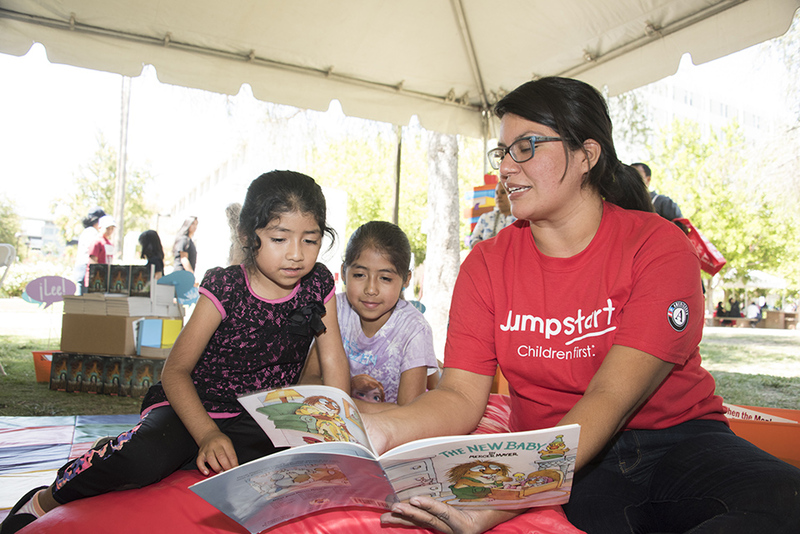 CSUN President Dianne F. Harrison reads to young people during Feria de Educación 2017. Photo by Sarah Dutton. Wellness screenings were a part of Feria de Educación 2017. Photo by Lee Choo. Marquita Grenot-Scheyer, CSU assistant vice chancellor for teacher education and public school programs, reads to young people in the reading garden. Photo by Lee Choo. 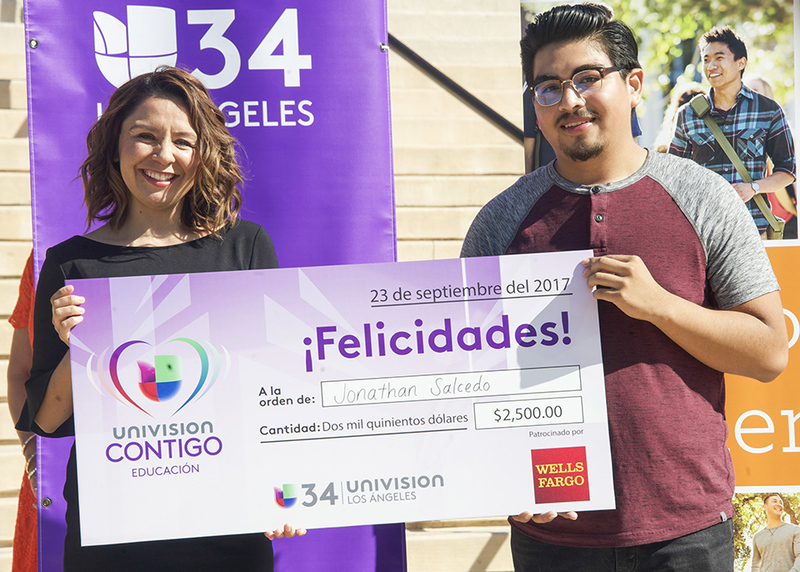 Jonathan Salcedo, a Canoga Park High School graduate, received a scholarship from Wells Fargo that he'll use when he transfers to CSUN in Fall 2018. Photo by Sarah Dutton. 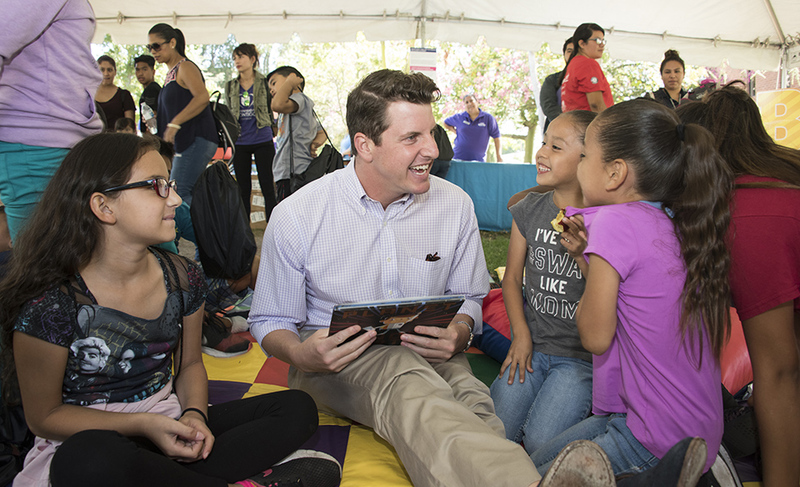 Sen. Henry Stern (D-27th District) took part in the Reading Garden at Feria de Educación 2017. Photo by Lee Choo. Feria de Educación 2017. Photo by Lee Choo. This volunteer reads to youngsters during Feria de Educación 2017. Photo by Lee Choo. 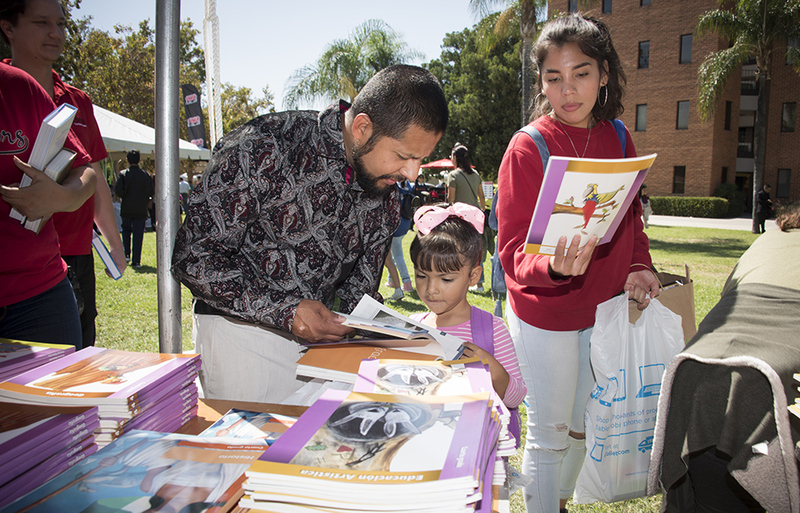 The ninth annual Feria de Educación brought approximately 10,000 people to California State University, Northridge on Sept. 23 to show young Latinos the power of education. 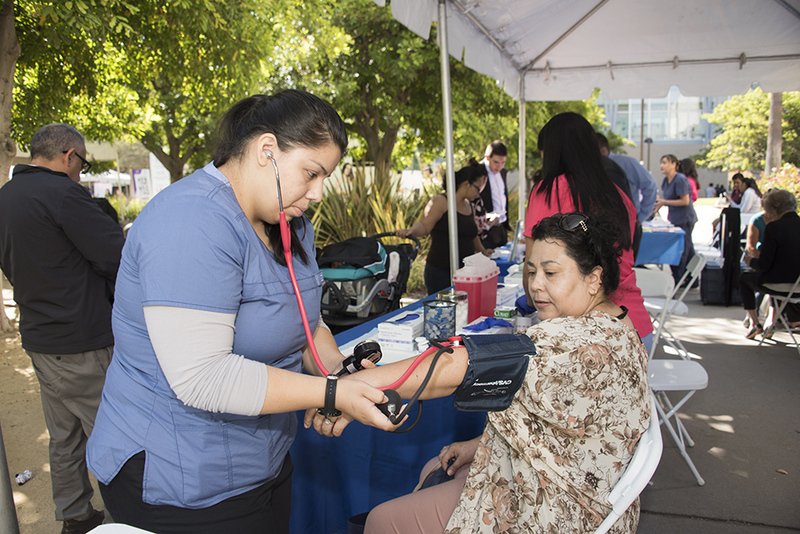 The day was filled with workshops, a reading garden, information booths and live acts from the stage in front of the Delmar T. Oviatt Library. The event’s main hallmarks, however, were hope and inspiration — by demonstrating the power and accessibility of education. For Mirna Villanueva, this year’s Feria de Educación served a dual purpose. When she became pregnant with her son, Abraham, Villanueva hit pause on her college education to concentrate on motherhood. Now that Abraham has reached fifth grade, Villanueva said she’s set to return to college. She attended this year’s Feria in search of information and inspiration — for her son and herself. “He’s already big enough to notice what he wants to be when he grows up,” Villanueva said of her son. “I wanted to establish that relationship between school, me and him. I wanted to teach him how if I can do it, anybody can do it. 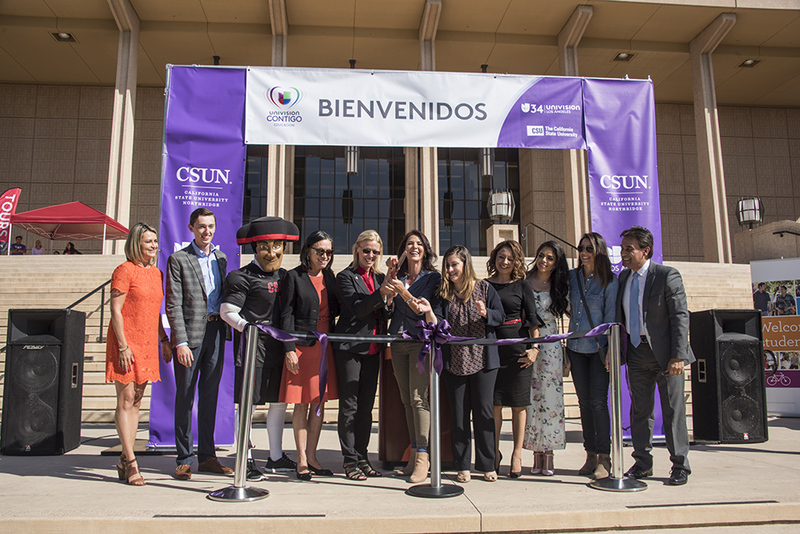 Feria de Educación is a partnership between the California State University (CSU) system and Univision, with CSUN hosting the event for the second year in a row. The day featured workshops and information booths, where attendees could find out more about preparing for college, financial aid, and the higher education programs available in California. An annual highlight of the event came from the Consul General of Mexico, which donated 15,000 books for children of all ages to take home for free. Marquita Grenot-Scheyer, CSU assistant vice chancellor for teacher education and public school programs, emphasized the need for people to aspire to become educators. The opening ceremony featured a series of special presentations, as four young people received scholarships presented by Wells Fargo, one of the event sponsors. The first recipient was Izzy Argueta, a CSUN freshman majoring in civil engineering. Argueta was born in El Salvador and came to the United States at the age of 5. Argueta is a recent graduate of Canoga Park High School and is a member of the university’s Bridge to the Future program, which gives scholars like Argueta financial assistance and mentorship on the path to graduation. Another Wells Fargo scholarship recipient, Jonathan Salcedo, is also a Canoga Park High School graduate — currently attending Pierce College. He’s earmarked the funds for next fall, when he plans to transfer to CSUN and major in computer engineering. He’s already planning to attend graduate school and possibly explore entrepreneurial opportunities in the future. Enlightening young people about those very opportunities is the principal goal of Feria de Educación. With the Latino population continuing to grow, the future will be even brighter for those who complete four-year and advanced degrees. This booming population inspired Univision to partner with the CSU to launch the event nearly a decade ago. Villanueva praised the outreach for younger children at the Feria de Educación. Many young participants donned “when I grow up” costumes: doctors, firefighters and many other professions that reflected their dreams.